2.1 Introduction: Why liquefying hydrogen? 3.1 Introduction: What is slush hydrogen? 15: Investment in the infrastructure for hydrogen passenger cars—New hype or reality? 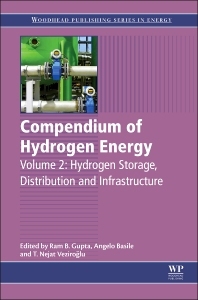 Compendium of Hydrogen Energy, Volume 2: Hydrogen Storage, Distribution and Infrastructure focuses on the storage and transmission of hydrogen. As many experts believe the hydrogen economy will, at some point, replace the fossil fuel economy as the primary source of the world’s energy, this book details hydrogen storage in pure form, including chapters on hydrogen liquefaction, slush production, as well as underground and pipeline storage. Other sections in the book explore physical and chemical storage, including environmentally sustainable methods of hydrogen production from water, with final chapters dedicated to hydrogen distribution and infrastructure. Dr. Veziroglu, a native of Turkey, graduated from the City and Guilds College, the Imperial College of Science and Technology, University of London, with degrees in Mechanical Engineering (A.C.G.I., B.Sc. ), Advanced Studies in Engineering (D.I.C.) and Heat Transfer (Ph.D.). In 1962 – after doing his military service in the Ordnance Section, serving in some Turkish government agencies and heading a private company – Dr. Veziroglu joined the University of Miami Engineering Faculty. In 1965, he became the Director of Graduate Studies and initiated the first Ph.D. Program in the School of Engineering and Architecture. He served as Chairman of the Department of Mechanical Engineering 1971 through 1975, in 1973 established the Clean Energy Research Institute, and was the Associate Dean for Research 1975 through 1979. He took a three years Leave of Absence (2004 through 2007) and founded UNIDO-ICHET (United Nations Industrial Development Organization – International Centre for Hydrogen Energy Technologies) in Istanbul, Turkey. On 15 May 2009, he attained the status of Professor Emeritus at the University of Miami. Dr. Veziroglu organized the first major conference on Hydrogen Energy: The Hydrogen Economy Miami Energy (THEME) Conference, Miami Beach, 18-20 March 1974. At the opening of this conference, Dr. Veziroglu proposed the Hydrogen Energy System as a permanent solution for the depletion of the fossil fuels and the environmental problems caused by their utilization. Soon after, the International Association for Hydrogen Energy (IAHE) was established, and Dr. Veziroglu was elected president. As President of IAHE, in 1976 he initiated the biennial World Hydrogen Energy Conferences (WHECs), and in 2005 the biennial World Hydrogen Technologies Conventions (WHTCs). In 1976, Dr. Veziroglu started publication of the International Journal of Hydrogen Energy (IJHE) as its Founding Editor-in-Chief, in order to publish and disseminate Hydrogen Energy related research and development results from around the world. IJHE has continuously grew; now it publishes twenty-four issues a year. He has published some 350 papers and scientific reports, edited 160 volumes of books and proceedings, and has co-authored the book “Solar Hydrogen Energy: The Power to Save the Earth”. Dr. Veziroglu has memberships in eighteen scientific organizations, has been elected to the Grade of Fellow in the British Institution of Mechanical Engineers, American Society of Mechanical Engineers and the American Association for the Advancement of Science, and is the Founding President of the International Association for Hydrogen Energy. Dr. Veziroglu has been the recipient of several international awards. He was presented the Turkish Presidential Science Award in 1974, made an Honorary Professor in Xian Jiaotong University of China in 1981, awarded the I. V. Kurchatov Medal by the Kurchatov Institute of Atomic Energy of U.S.S.R. in 1982, the Energy for Mankind Award by the Global Energy Society in 1986, and elected to the Argentinean Academy of Sciences in 1988. In 2000, he was nominated for Nobel Prize in Economics, for conceiving the Hydrogen Economy and striving towards its establishment.